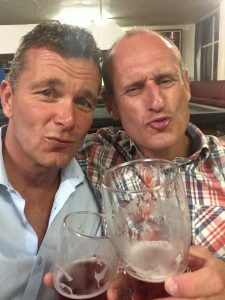 Former rugby star Richard Diplock, who played for Aberavon and Bridgend in the 1980s and 90s, has agreed to step into the boxing ring on April 28th, in support of Sean fundraising for the Velindre Cancer Centre and his West Coast Ride in America this September. Diplock,52, who played for his country against Romania in Cardiff in 1988, has tried to keep himself fit since retiring from the game over 17 years ago, agreeing to a white collar boxing bout would be a challenge for someone half his age. The Tata steel worker, who retired from rugby when he was 35, said: “After I finished playing my friend Mark Watkins, who runs classes at the Vitality Health & Fitness in Port Talbot , told me to come along and do some training to stop me from stiffening up. It really helps. Richard has decided to throw his hat into the ring after hearing about his friend’s fundraising plans. He said: “When Sean said he was doing a bike ride across the West Coast of America for Velindre Cancer Centre, I said I would do the white collar boxing to help him with the fundraising. Having agreed to take part in a WKO Promotions Strength and Honour Fight Night at the Samuel Centre in Llanelli on Saturday, April 28, Richard is keen to point out he is not a natural fighter. He joked: “If there was a fight when I was playing rugby I would just stand there and watch the forwards get on with it! He does say however that the nerves are creeping in ahead of the three two-minute-rounds fight. He said: “I am nervous about stepping into the ring. While they try not to have a miss-match, and my opponent will be a novice like me, he is bound to be younger. “When I played for Wales I was part of a team, when I step in that ring I will be there on my own. People who have done it before have told me there’s nothing that can prepare you for what is going to be the toughest experience of your life.